Le Mans Christmas Market and many other festive celebrations are now in full swing and the Market will run daily until Christmas Eve. 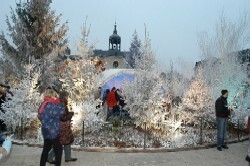 The Le Mans Christmas Market village is located in Place de la République and as well as dozens of artisanal produce and craft stalls it includes a number of animations, among them a model train display. Naturally, Father Christmas is also in attendance – in his “chalet” rather than his grotto, though. In the old town of Le Mans – the Cité Plantagenêt – Les Nuits des Chimères returns with its wonderful “son-et-lumière” show of light projections on various buildings at nightfall. The Christmas Nuits des Chimères can be seen from 17th December until New Year’s Day. 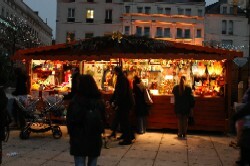 From 16th to 18th December there’s a special Christmas Market of pottery and ceramics at Place de la Sirène between 9 a.m. and 7 p.m.
From 16th to 22nd December there is an Artists’ Market in Place de la République. These are just a few of the events – there are also concerts and other entertainments planned throughout the Xmas hoilday period. Download the full programme of Christmas Events for Le Mans “Fête Noël“. I’ve been wondering where the best Christmas markets in northern France are – this looks like one to try!